Dining On the Banks. Excellent River Lee Hotel Experience. Friday evening and we are shown to our riverside table in the aptly named Weir Restaurant in the city centre River Lee Hotel. We are early but soon the large comfortable room fills up; the nearby bar is already full of groups, large and small, enjoying the food and the drinks. Our menu is promising, from regulars such as Roast Supreme of Skeaghanore Duck to specials like the Ballinwillin Wild Boar Chop. We meet some of the team, including Head Chef Shane O’Sullivan (sometimes it pays to turn up early), and we are left to make our choices. A glass of ruby red fruity French Merlot (Croix des Vents) and CL’s vibrant New Zealand Sauvignon Blanc (Ribbonwood) are sipped as the choices are made. Great to see so much local produce on the menu and I go for the Panfried Castletownbere Scallops in Lemon foam with a seafood cracker. It is superb. 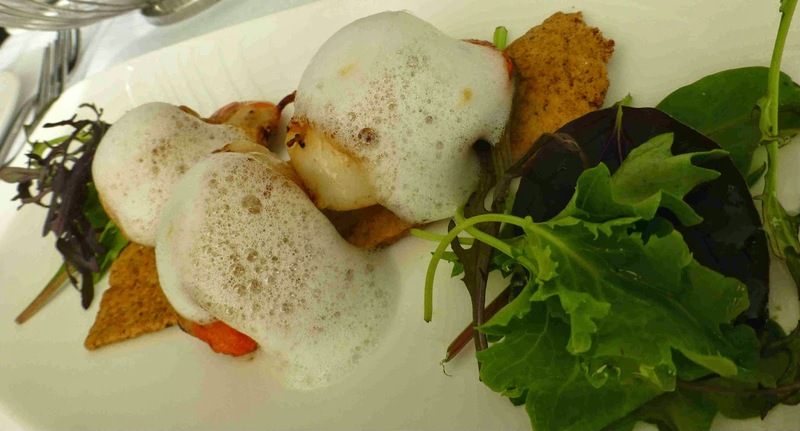 The scallops are as fresh as can be and the Lemon foam, not just for show, plays a complementary role. The other starter, perhaps more substantial, is the Chicken Liver Pate, with Foie Gras and Rosemary Butter, pickled apple chutney and walnut bread crostini, quite an engaging mix of textures and flavours and is also very well received. The sun gets low to the west and the restaurant team pick the right moment to drop the window shades and so diners continue in comfort. Service here is friendly and knowledgeable, all eager to help. I get something of a surprise when my main course arrives. The day’s special, the Wild Boar Chop, is rather large! But not to worry, it is dispatched with some pleasure, aside from some of the opulent fat that is left on the plate. 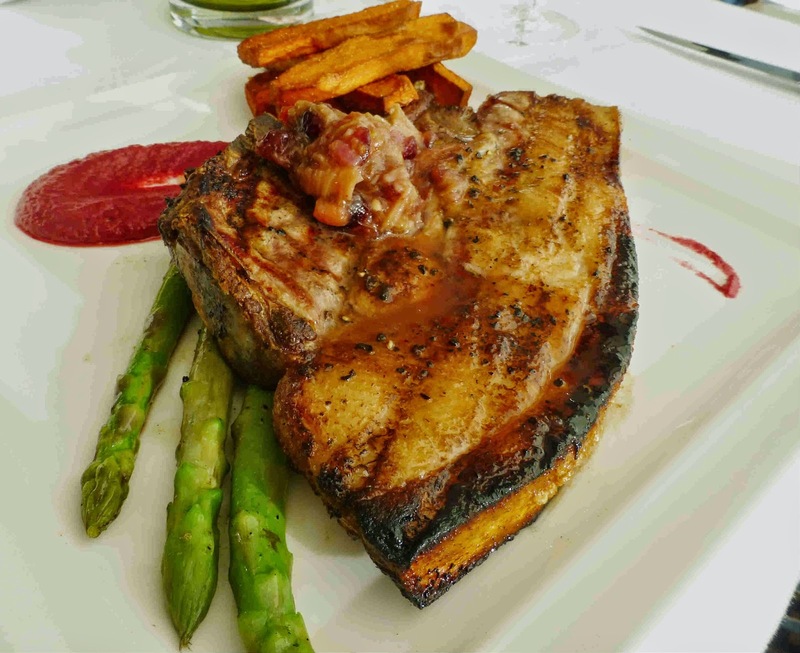 The chop is served with steamed asparagus, beetroot puree, sweet potato chips and an amazing warm rhubarb relish. Ballinwillin House is a country house, (with a Hungarian counterpart), near Mitchelstown. Check it out here . CL often goes for seafood and her mains choice was no exception. 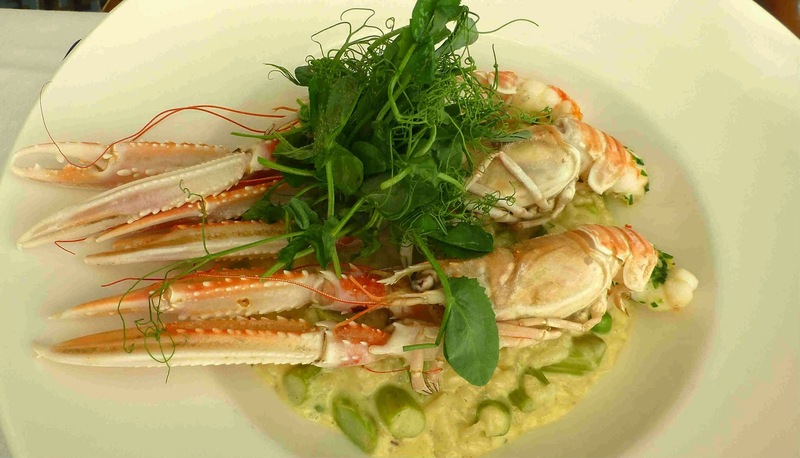 Her Grilled Castletownbere Langoustines, the chef’s June Seasonal Signature Dish, was accompanied by a Pea, Asparagus and Seafood Risotto and finished with Iasc Seafood Butter. Another top notch dish. They serve a great Cork cheese board here but we went for the sweet stuff! And enjoyed it, every bit. My dessert was the Raspberry Tiramisu. 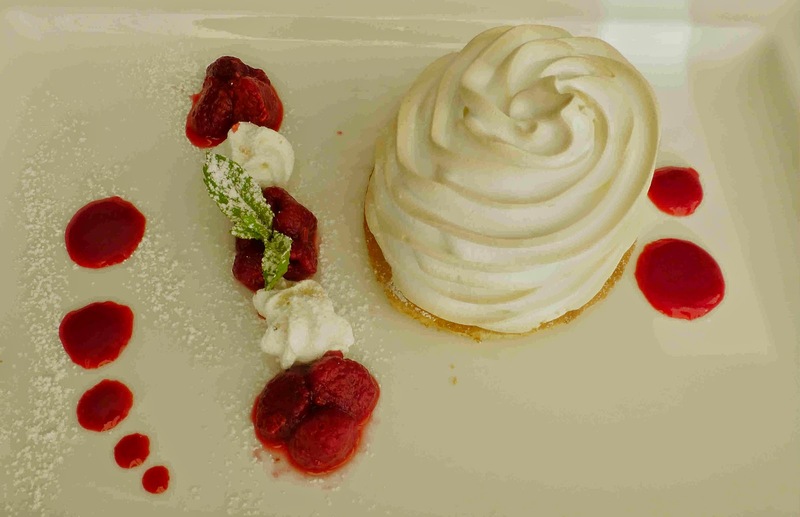 Raspberries also featured on the other dessert, the Baked Alaska, one that you don't see too often nowadays. Both were excellent and it was two happy diners that headed off down the sunny street. Filling a few bags as well! Looks like quite a few of the traders from the Midleton Farmers Market are heading to the City Hall on Monday for the Cork Kerry Food Forum and Artisan Fair. The afternoon session, from 12.30pm on, is open to the public and you’ll have a chance to sample and buy the products. In the morning, there might well be a question or two about rulebook regulation hampering the development of small producers. That was certainly a topic in Midleton on Saturday. There is agreement that regulation is needed but so too is common sense. The difference between shopping at a market and elsewhere was heavily and pleasantly underlined for me on Saturday. So many stops, so many chats, even a recipe from one producer. 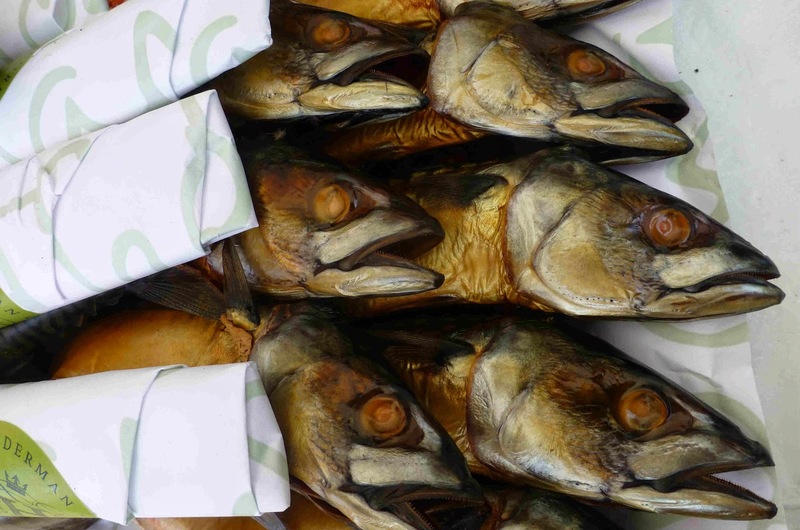 Bought one of Frank Hederman’s smoked mackerel (I know lots of you love the fillets but you must try the whole fish smoked on the bone) and Frank himself gave us a few tips on making the best use of it. Cobh's Just Food started off at a corner of a stall in Midleton and it was great to see Deirdre Hilliard back in the market and supporting the stall-holders. She’ll be in the City Hall on Monday as will Jane Hegarty of Ardsallagh Goats. I was gossiping away to Jane as she handed out samples and one of them stopped me in full flow. It was a mature cheddar, four years old, delicious. She hasn't much left though and when its gone…. Deirdre’s nieces, Lilly and Roisin Higgins, were ”breakfasting” at the market but I don't think they got too much at all as their kids weren't inclined to leave any of the gorgeous pizza after them! 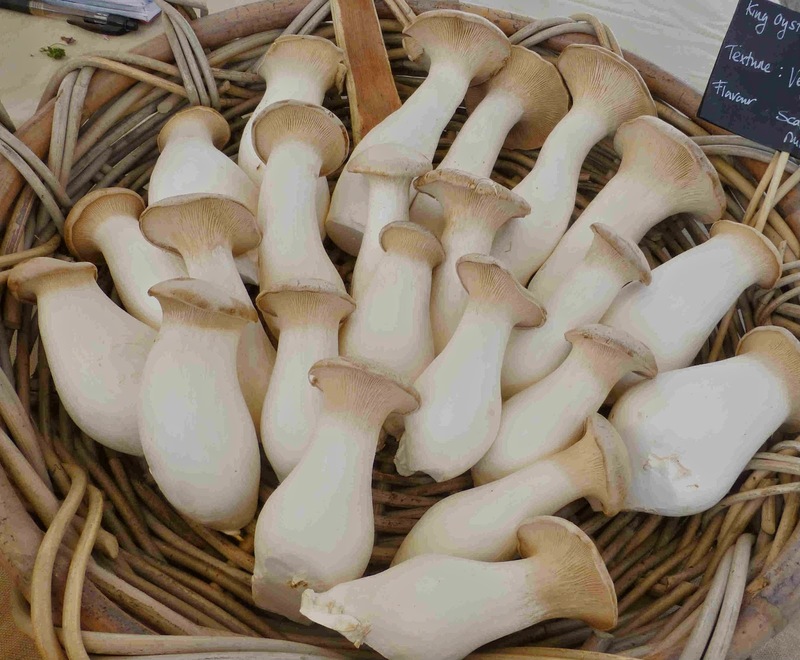 Had a chat too with Lucy from Ballyhoura Mushrooms but forgot (too much gossip going on) to go back and buy some. Next time Lucy! Mackerel, smoked on the bone. Bumped into Colm and Aoife McCann from Ballymaloe and Peter Corr of Febvre Wine, and children. Colm is busy as usual lining up great wine events for Ballymaloe and has high hopes for the visit of the amazing Riedel Wine Glasses Show in November. That’s a long way off but there’ll be plenty of tastings and so on in between and we’ll let you know as soon as Colm has confirmed. Also stopped to say hello to Noreen Conroy of Woodside Farm. They now have two stalls in the market, the second selling their delicious hot food. 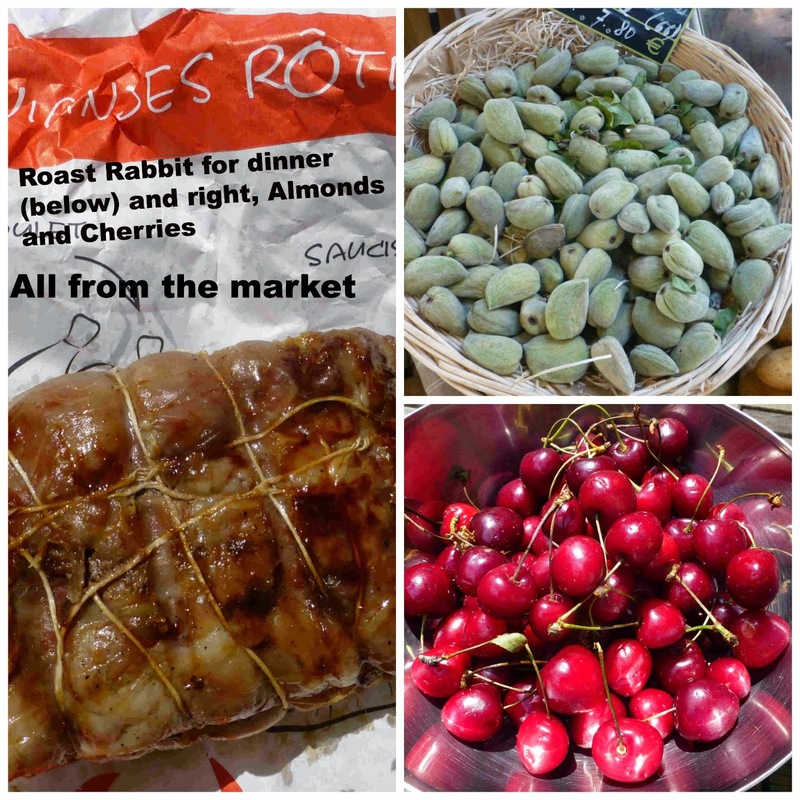 We did manage to buy a few other bits and pieces, including (under instructions from Mr Hederman) some Ballycotton spuds from Willie, irresistible strawberries from Rose Cottage Farm and, of course, bread from Arbutus. Another chat (French themed!) 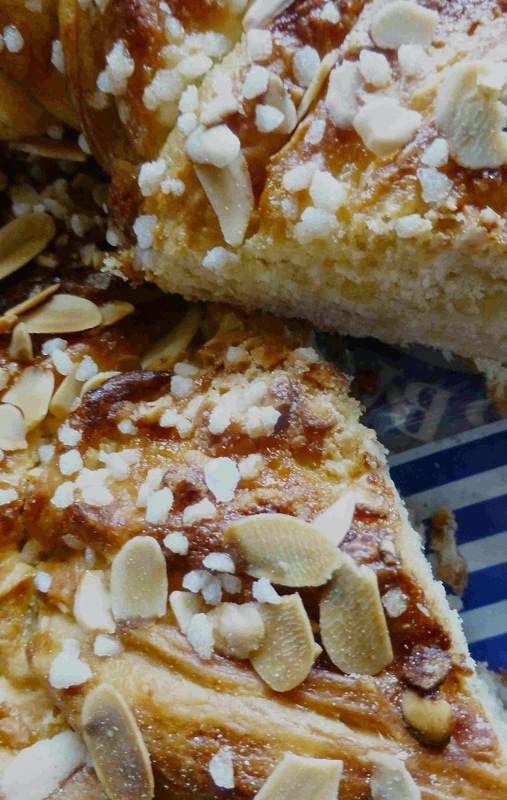 here of course with Declan and Deirdre before we retreated back to the city with one of their delicious Almond and Saffron Rings in the bag. Half of it is gone already and I don't think it will last the day! 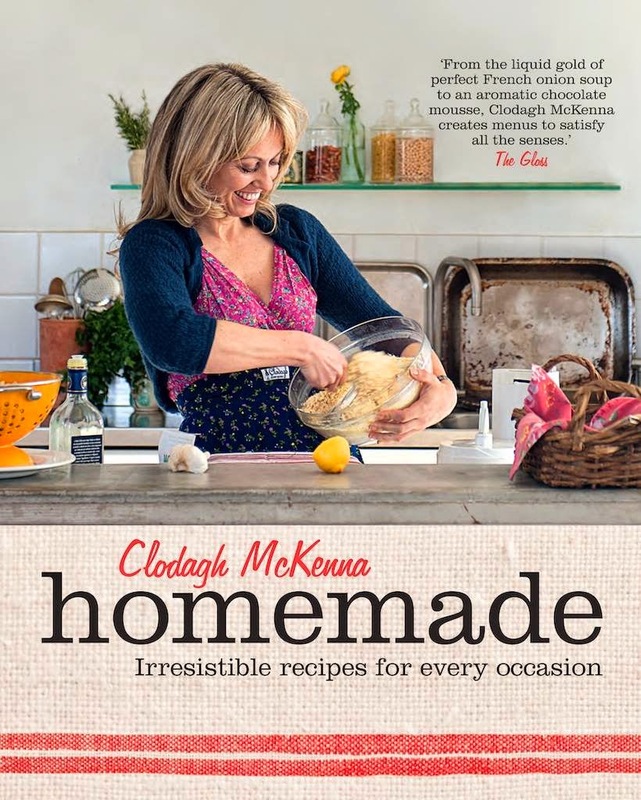 Clodagh McKenna is in Cork City next Thursday for the local launch of her book "Homemade". The launch, in the Crawford Gallery Cafe, takes the form of a dinner, five courses no less, and you get also get a signed copy of the revised book, all for forty five euro. We got our hands on a copy of the menu and I've booked my ticket. Came home from the recent holiday in Bordeaux with a stash of wine. Nothing unusual about that! The advice that came it was to leave it rest for about three weeks after its travels. Could have done with three weeks rest myself! Three weeks without touching the St Emilion and Sauternes could be fairly frustrating, I thought. On the day home though, I spotted (invented?) a solution in the wine shop on the Brittany Ferry Pont Aven. They had a well priced double, a 2011 red and white from Bordeaux’s Chateau Magneau. These are used to traveling, I thought, and so, with that flimsy excuse, the pair were the first to be opened. 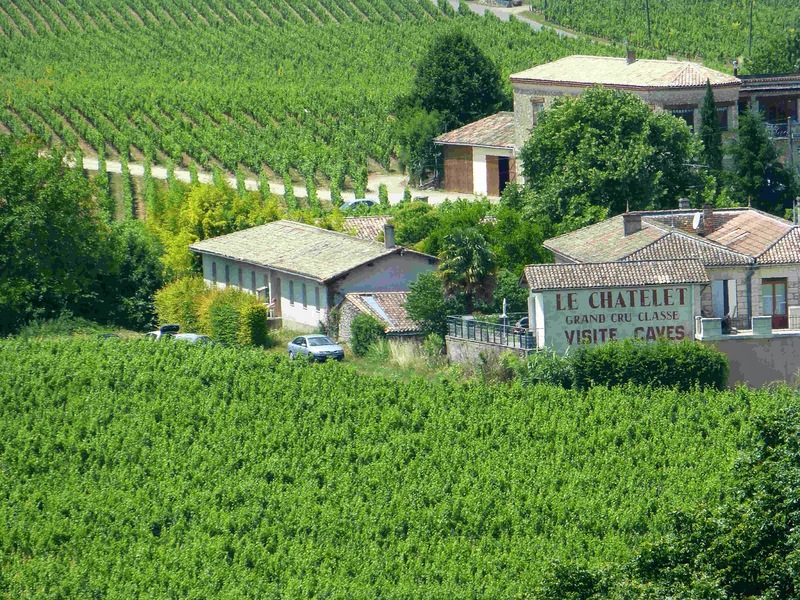 I had made the acquaintance of the wines from this Graves chateau in the Maison des Vins de Graves on the outskirts of Podensac and had confidence in its quality. I drank an elder cousin of the rouge but hadn't tasted either of the 2011s. I wouldn't be disappointed! On board value, for wines in general, was pretty good too. Can’t find the receipt but the two bottles cost about £17.50 (about 25 euro). If you’re taking the ferry to France this year, keep an eye out for this and similar offers. Staying on dry land? 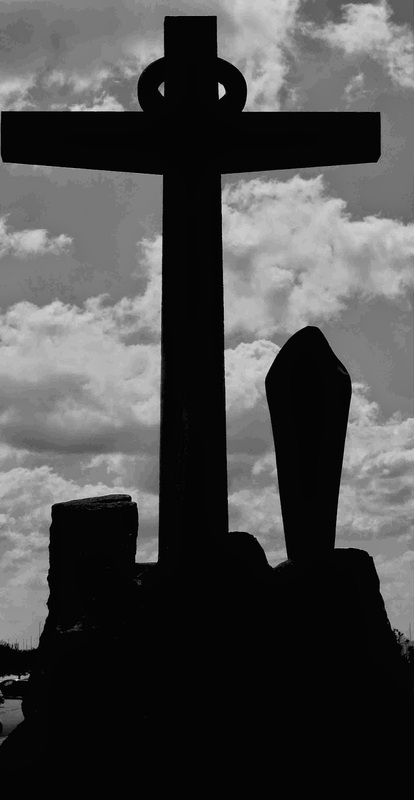 Then, From Vineyards Direct have some interesting Graves here and so too have Curious Wines. Grape variety here is 50% Merlot, 45% Cabernet Sauvignon, 5% Cabernet Franc. It has spent 12 months in oak casks (1/3 new) for 12 months. It has rich aromas with hints of red fruits and it is full-bodied with an elegant mouthfeel. Tannins are well-blended and all in all it is a very pleasant wine indeed, a good complement for all red meats and cheese and likely to be even better in a year or two. I do like a decent bit of Semillon in my Bordeaux whites and this, a local gold medal winner, has 40%. The other varieties, both traditional in the blend, are Sauvignon (45%) and Muscadelle (15). This, with complex aromas, was probably the more satisfactory of the pair, well structured, elegant, fruity with a long lasting aftertaste, the perfect mix of full body and intensity. A lovely aperitif and likely to be a good match with seafood and fish. Mine is not the only stamp of approval! 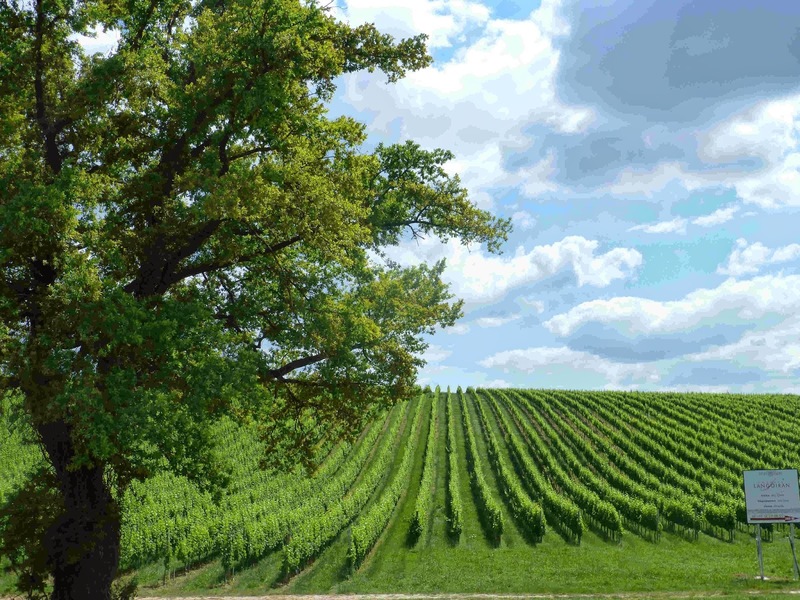 Magneau wines are produced under the method of cultivation known as Terra Vitis: " the stamp of French vinegrower-winemakers who respect nature and Man and who craft wines to please the taste buds." As luck would have it, I arrived at the Fresh from West Cork stall in the English Market just as Mairtin O’Mealoid from Cape Clear Farm was making a delivery of his salads, picked early that morning. A couple of bites later - not the Chiellini type - and I was happy I had my Taste of the Week. 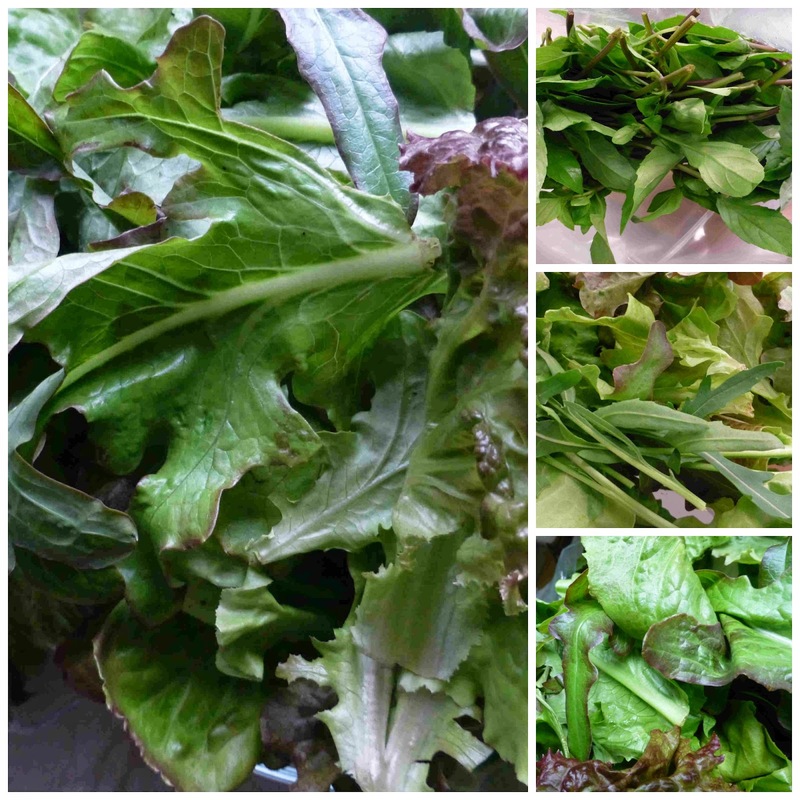 The huge bag of mixed salad leaves is great value and fantastic quality. Try it. But do try and get yours hands on some of his other leaves. You've often heard that Rocket is peppery and have often been disappointed when you tasted it. You won't be disappointed with the flavour of Mairtin’s island grown variety. And another one to watch out for is their Thai Basil - unbeatable flavours and aromas (top right in photo). And it is not just salads. The farm also do flowers, tomatoes, asparagus and other vegetables, all grown using natural methods (earthworms play a major role!). Check the farm out on Facebook above or on their website here. Sherry Baby. Sorry, I’m Late. Missed Sherry Week - didn't have the nerve to ask for one in Bordeaux - but made amends immediately on returning home by opening a bottle of Lustau’s Palo Cortado. Palo Cortado is one of the ten (at least) styles of sherry, coming midway in the range between light and dark, between Fino and Pedro Ximenez, "combining the delicate bouquet of an Amontillado with the body and palate of an Oloroso". The Lustau Solera Reserva Palo Cortado Peninsula, to give it its full title, is a terrific example of the style. It has an ABV of 19 per cent (usually about 15 for a Fino) and its inviting bouquet is followed by rich nutty flavours. I bought mine at Bradley’s, North Main Street. They sell it in a handy 37.5 cl sized bottle - you don't want your sherry hanging around too long. In the “olden” days, the Sherry bottle was kept from Christmas to Christmas. God knows, maybe the postman knows, what it tasted like after five years in the back of the cupboard! Sherry, presumably in good condition, has been described by Alexander Fleming (the discoverer of penicillin) as the best remedy against disease. I’ve seen a recommendation, from those that know, that this style, once opened, should be kept tightly corked in the fridge for no more than 6 weeks. No excuse for keeping a 37.5 cl bottle that long though. Unlike other wines, the sherry bottle should be stored upright in order to reduce the surface of wine exposed to oxidation to a minimum. And oxidation does kick in immediately, so don't put off finishing your bottle. Lots of appropriate moments to enjoy your Palo Cortado. Use it as an aperitif and other recommendations from the folks in Jerez (the only place in the world where Sherry is made) include using it with nuts, cured cheese, cold meats, tuna, game, and stewed meat. Ideal serving temperature is 12-14 degrees celsius. Now, in which corner of the fridge did I leave that Lustau? Now you can put Wilton on your Farmer’s Market list! 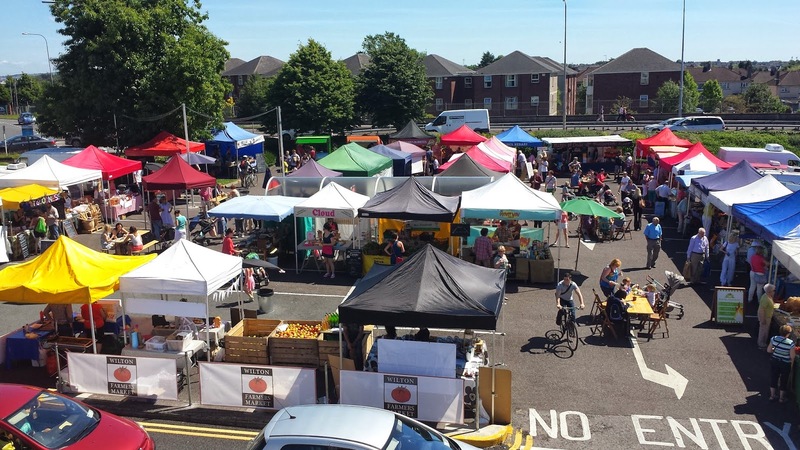 Most Cork foodies are well catered for towards the end of the week but Wilton has come to the rescue in the early days of the week by announcing a Farmers Market every Tuesday. 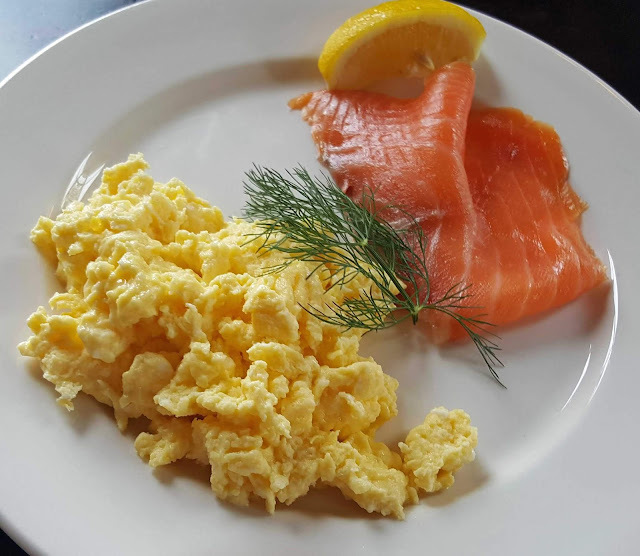 “Wilton Shopping Centre want to support our local farmers and artisan producers by ensuring they have a direct outlet in which to sell their produce every week,” says Susanne Irwin, Manager of Wilton Shopping Centre. 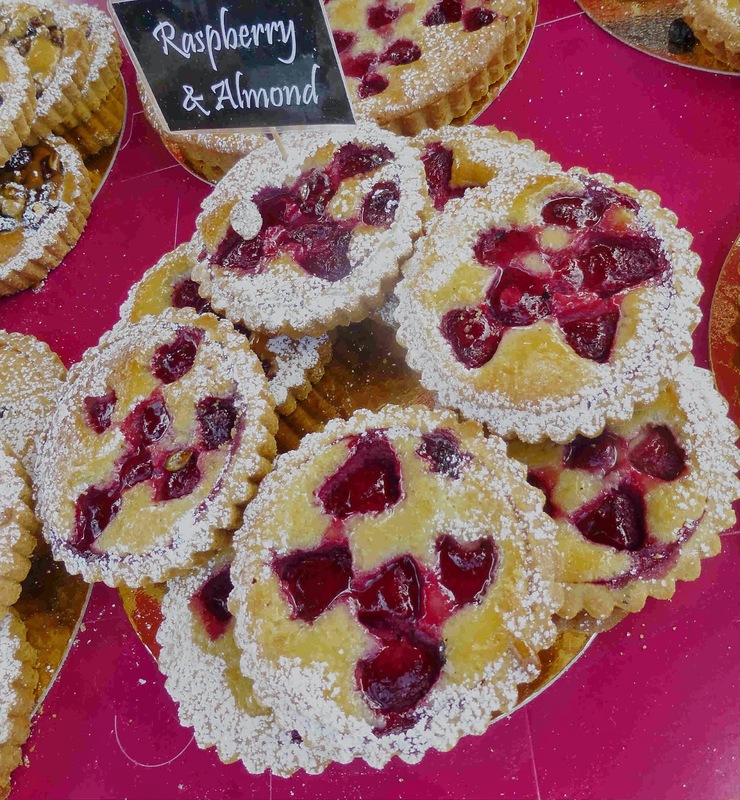 The diversity and variety of stalls at Wilton Farmer’s Market is second to none and this market will surely become a weekly visit for foodies all over Cork. The Wilton Farmer’s Market will be on every Tuesday from 10am to 2.30pm. Advises "Skip the bank, go to the people"
Cork wine company Curious Wines run by brothers Mike Kane and Matt Kane, one of the first wine companies in Ireland to use the web and social media to get business, are innovating again. The brothers are expanding their business by opening a wine warehouse and retail space in Naas, just off the M7 as a foothold into the greater South Dublin area. However, rather than relying on the banks to finance the expansion, it was apparent they had the necessary funding right at their finger-tips – through their own customers. "We needed an additional €30,000 of financing but instead of jumping through hoops by having to educate, prod and cajole a bank manager, we went to the people who understand and believe in our business: our customers, our friends,” stated MD Michael Kane. Curious Wines are one of many businesses in Ireland using new forms of financing, based on peer-to-peer lending or crowd-funding. Here they're using LinkedFinance, where individuals get to bid "micro" loans at rates that suit them. When enough people bid the loan becomes an auction, with the loan fulfilled at the lowest rates bid. Where Curious have struck gold again is in offering the loan to their customers first. Rafferty continued: “Curious Wines has embraced Linked Finance as a way to raise finance to expand their Irish business in the ultimate fashion. By engaging with their own customers, they have driven the speed of the fulfilment, and driven down the rate at which people are prepared to invest in them. 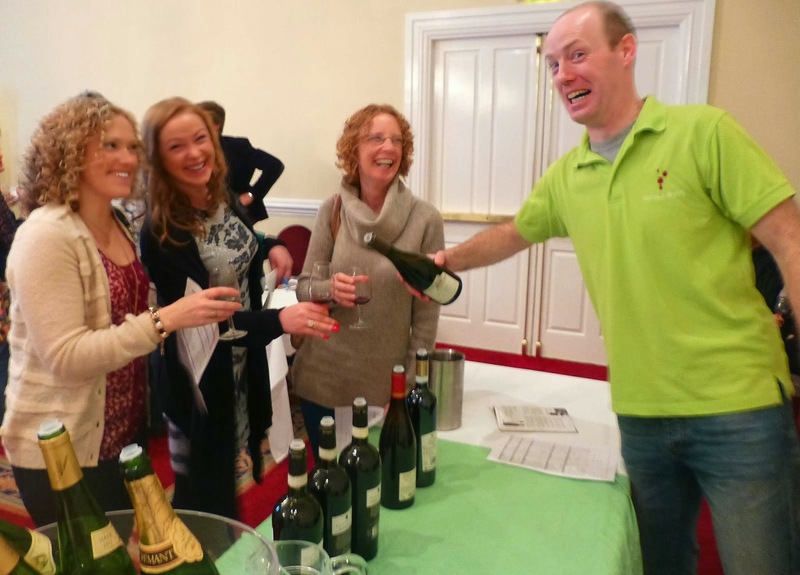 Not only are they receiving the finance they need to grow, they’re turning their current customers into lenders and advocates for their business and they’ve also publicised their wine business to the thousands of lenders supporting Irish SMEs on LinkedFinance.com. Now that's what we call a real alternative to the banks!” continued Rafferty. Would you get €30,000 from your bank in a week? Matthew Kane, Curious Wines’ Operations Manager, who will run the Naas location: "We're blown away that in just a week we're at 75% of our €30,000 loan without pushing it that hard. We sent an email to our newsletter list and put up a few tweets and our friends and supporters spread the news via word of mouth. It's a total endorsement of what we're doing by our own customers." Curious Wines are of the view that new direct to public financing models are a future that SMEs need to consider. Michael Kane MD: "Despite all the fancy advertising saying banks are lending money, they're still far too conservative and strangling people in paper and conditions, we would urge many SMEs that are looking for financing to investigate LinkedFinance. These are the credit unions, the community coop banks of the 21st century"
The new Curious Wines location will be a 6,000 square foot unit in Tougher Business Park, Newhall, between Naas and Newbridge, just 3km from the M7 Dublin-Cork motorway. Around half the space will be used for retail, with the other half supporting the growing warehousing and distribution requirements of Curious’ nationwide online and wholesale business. 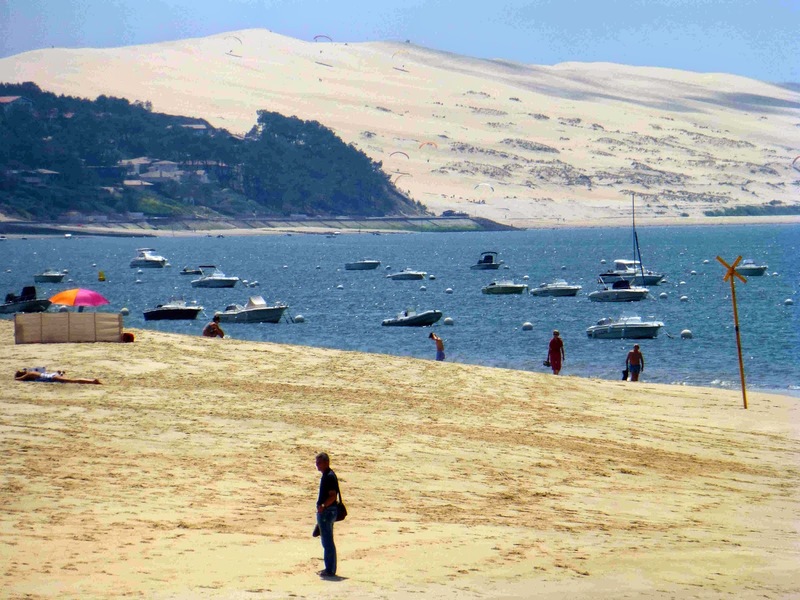 Our Arcachon adventure came to a very pleasant end this weekend. Left the town on Friday morning and it was sunshine all the way until we arrived in Cobh on Saturday morning. Highlight was undoubtedly the meal in Le Flora on Brittany Ferries. We don't usually do it on the return but we were glad we did this time. Beside the great food we had a great view outside the window as the sun set to the west. 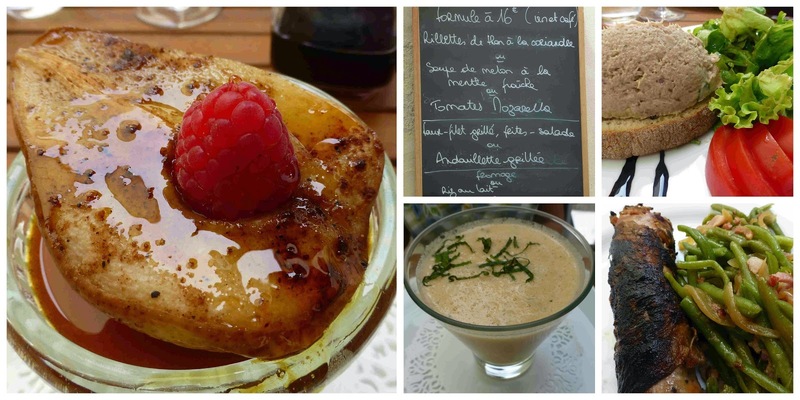 Filet (beef), Mixed Fruit, and Clafoutis! The drive up went very well. The Rocade In Bordeaux was quite busy but there was no major build-up of traffic and it went well for us. Much the same in Nantes and Rennes. These are smaller ring roads but can be trickier, especially on the way home. For instance, there is a place a few kilometers from Rennes (towards Brest) where you exit right and stay left. Sounds contrary as the Sat-Nav shouts it but there is an immediate choice to be made once you do exit. On your guard, then! Quite a few Irish people travel the stretch between Nantes and Bordeaux and vice versa. The toll is one payment of €28.50. It is a very well equipped road with some great stops. 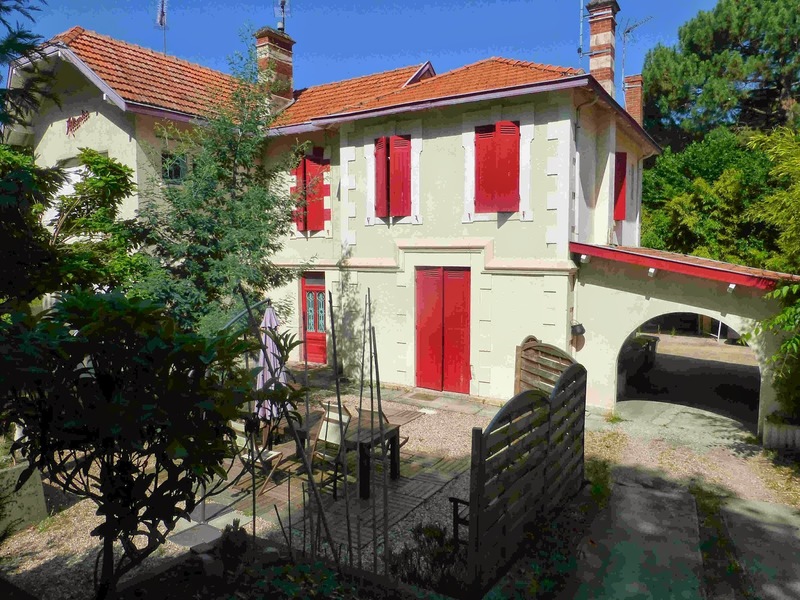 On the way north and just out of Bordeaux you’ll find all you want at Saugon and later at the revamped Aire Poitou Charente Sud. By the way, the petrol pumps here are credit card operated, like more and more in France. It is easy enough to operate as there is an English language option (though it doesn't always work). It is, in any case, easy enough to follow. You put in your card, validate it and have an euro amount (usually much more than you’ll need) approved. Then pick up the pump head and fill away. Overall, this is one of best return trips we've ever had. The ferry even left Roscoff ahead of schedule! And wasn't it great to come back to the harbour and see all that sunshine. Happy traveling! 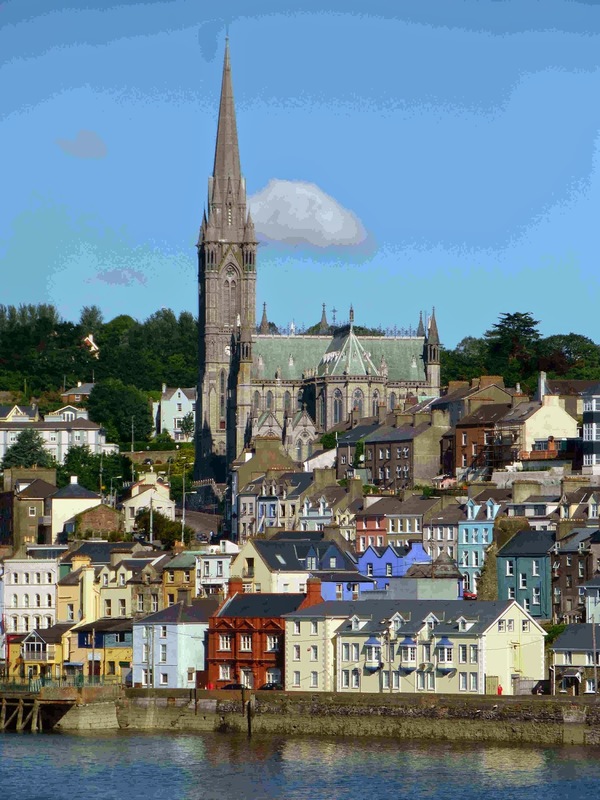 Cobh and its cathedral this morning. 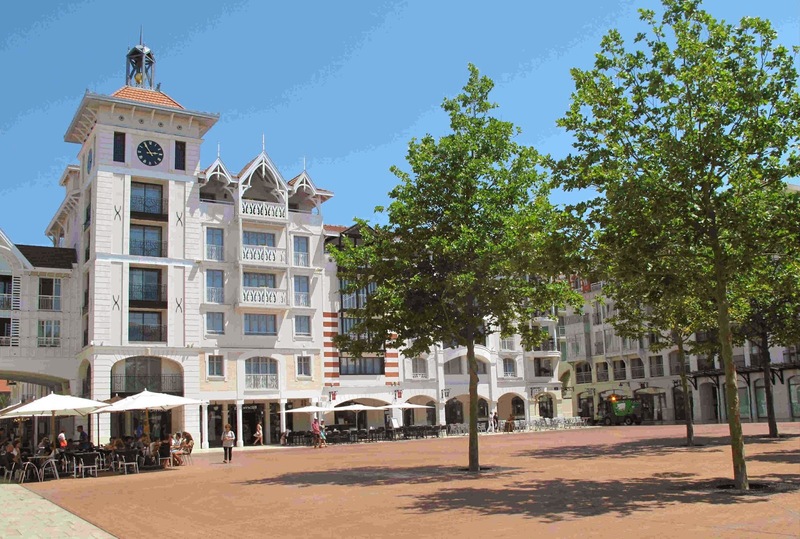 The square where the daily Arcachon market takes place. I have enjoyed all the wine trips on this holiday but it looks as if I’ll have one disappointment. Just can’t get my hands on a couple of bottles of the Listrac (Medoc) white by Saransot-Dupre. Tried another three wine shops in the centre of town today. All told me it was a very good wine but none had it in stock. One guy had the red and says he sometimes has the white but that was as close as it got. The trip to the town centre, a short one, was otherwise worthwhile and some last minute shopping was done. So no Saransot-Dupre. But it could have been much worse as I had to strongarm Clare out of the path of a motorist who failed to stop at a pedestrian crossing. Indeed, he or she did slow down but then seemed to hit the wrong pedal and shot forward, missing us by inches (as we jumped backwards) and shooting into the middle of the adjacent roundabout. Phew! Earlier, it had all been much calmer as we took a final turn on our favourite walk here, that around the outer road of the marina. Midweek, but action galore on the water. It never seems to stop. Our base for the past few weeks. One of the purchases in the town was a few local craft beers, a different selection to that previously enjoyed. They are all nicely cool now for the evening’s dinner. Again, this is coming from our nearest traiteur, the main course being a Mexican Chicken dish. 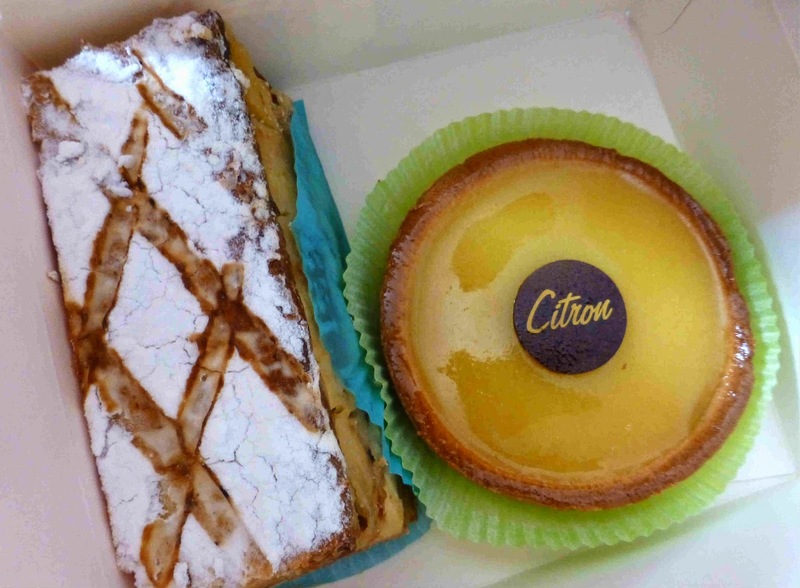 Oh, by the way, we broke out this morning and made our first visit to a patisserie and dessert will be a Mille Feuille and a Citron cake. Nice! After that, will check on England vs Uruguay and then to bed as we’ll have to be up a bit earlier than usual to finish off the packing and hit the long road to Roscoff. 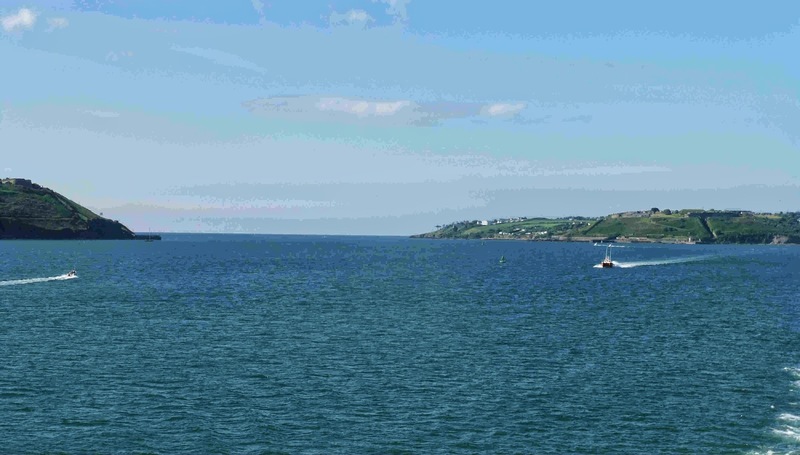 Looking forward now to getting home and seeing Roche’s Point in the sunshine. A bientot! 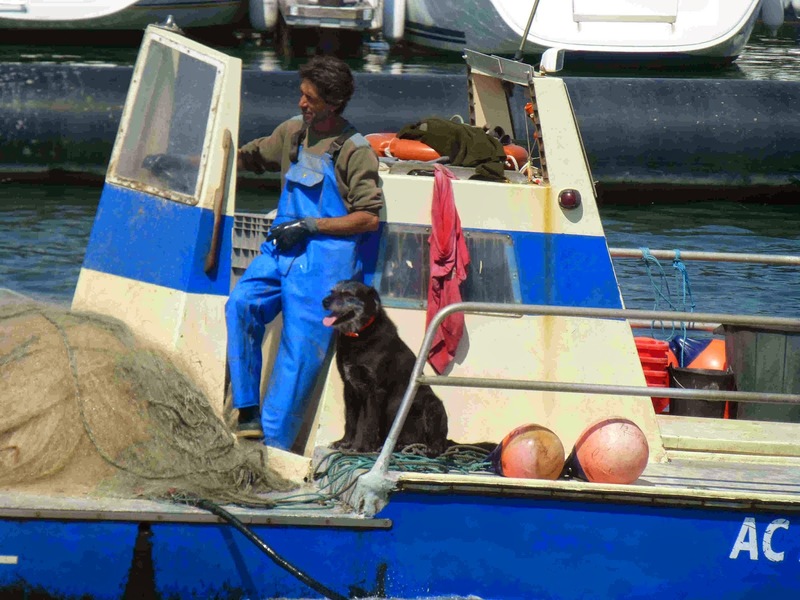 Fisherman and his dog coming back to Arcachon this morning. Sweet End Sauternes. Good Value Lunch There Too. 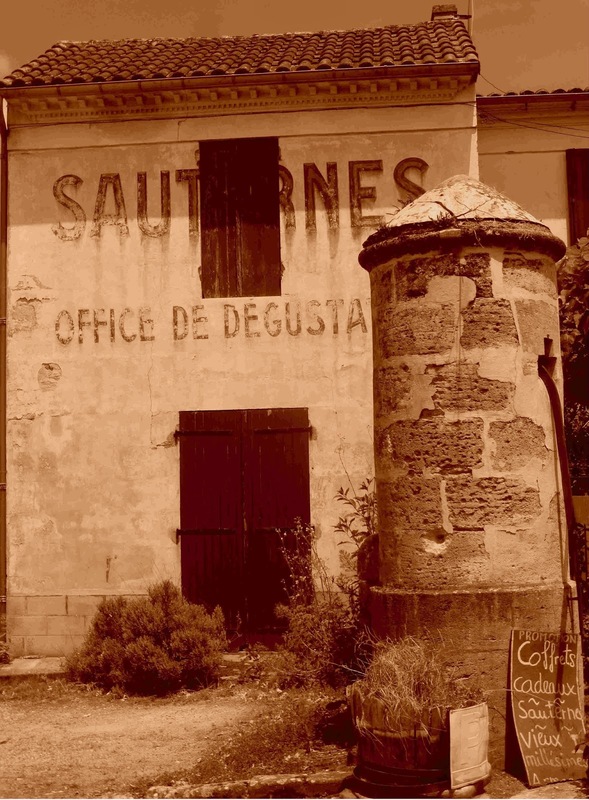 This extended three week wine tasting in Bordeaux just had to end in Sauternes. 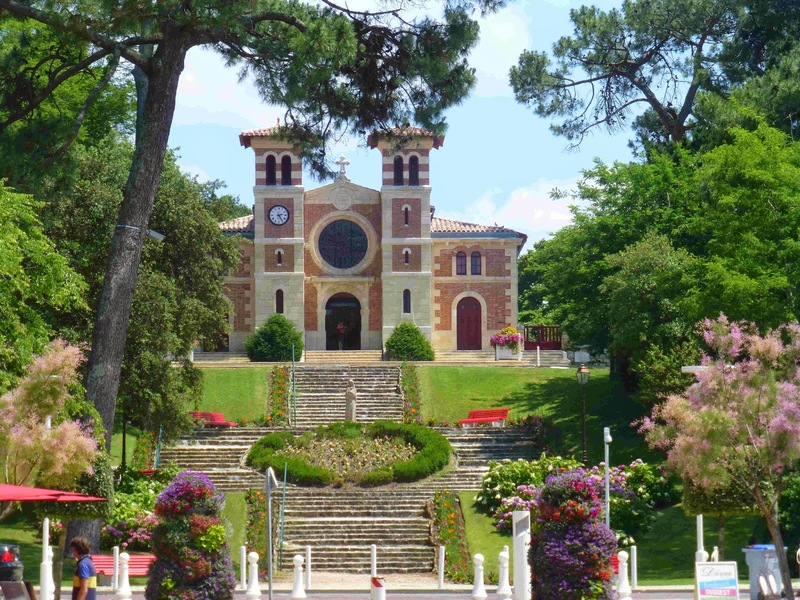 And that little village was indeed our destination today, the last of our wine journeys this trip. 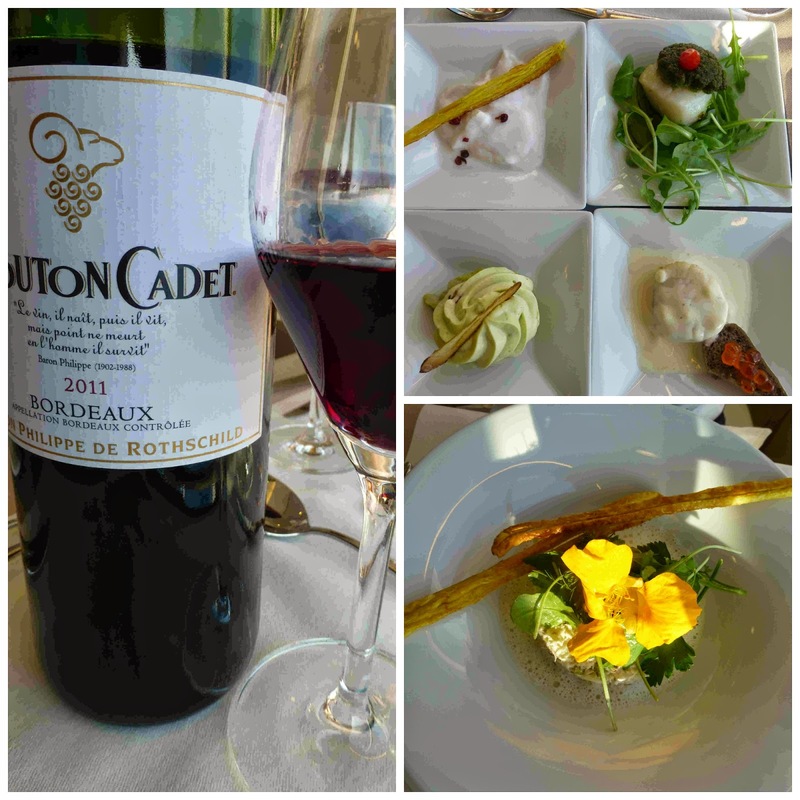 We enjoyed it, the wine that is, and had a very agreeable surprise in a local restaurant, Auberge des Vignes, when we had a three course Menu du Jour, that also included wine and coffee, all for just sixteen euro per head. 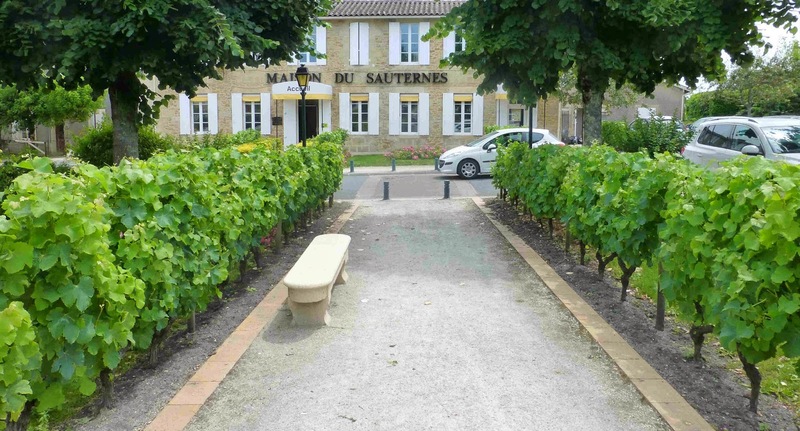 Our first call though was to Maison de Sauternes, a non profit establishment right in the middle of the village that represents dozens of growers and sells the golden liquid (the older, the more golden generally) that they produce at chateau prices. Luckily, we met a man with quite good English who guided us through the wines and the tasting. 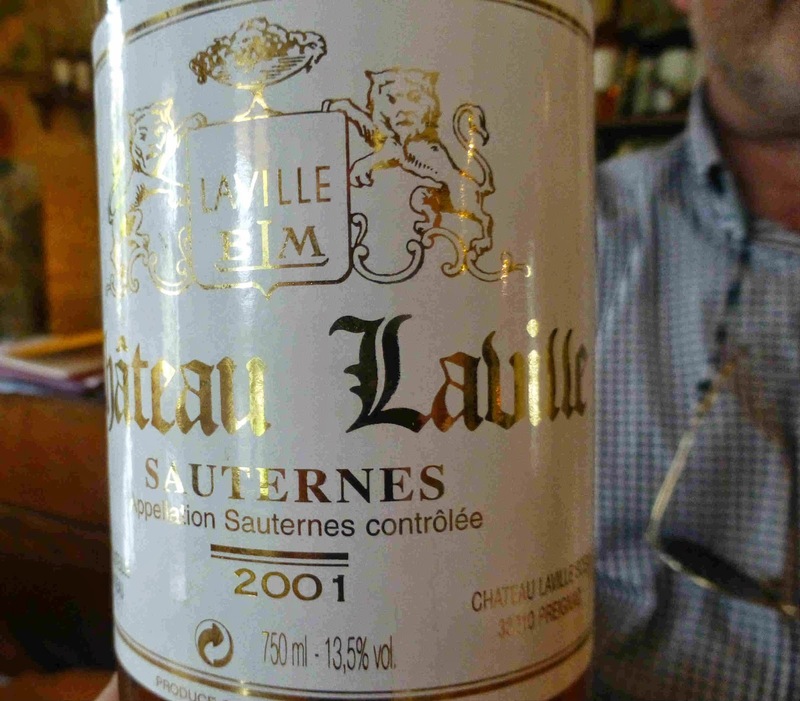 We started off with a very promising Sauterne for just under 12 euro and then moved up in price and age. We didn't want to buy too much dessert wine as simply we don't drink that much of it. We had settled on three bottles but our friend was also a good salesman and we left with four and also some very good advice about their care and travel. Then we strolled around looking for food but a Michelin recommended restaurant was expecting a large number in and we two could end up at the back of the queue so we thanked the young lady and moved on down the road where a few metres later we came across the Auberge des Vignes and its friendly staff. Couldn't believe the Menu du Jour. Aside from the good price, including unusually wine and coffee, there were also some decent choices, three starters and three desserts for instance. My starter was the Rillettes de Thon (tuna) a la coriander while CL picked the Soupe de Melon a la menthe (mint) fraiche. The third starter was Tomates Mozzarella. Don’t know about the third but ours were excellent. Neither of us wanted to chance the Faux-filet grillé (we had seen a customer struggling to cut through it) so both picked the Andouillette (chitterlings) grillé, grilled in the fire inside (we were eating outside on a lovely day). They were served with green beans, onions and bits of bacon, a brilliant combination of flavours and textures. Enjoyed the tasting here today! Cheese was one of the dessert options, Rice with Milk another. We picked the Panna Cotta, Poire (pear) roti, caramel, Passion (passionfruit, I presume!). 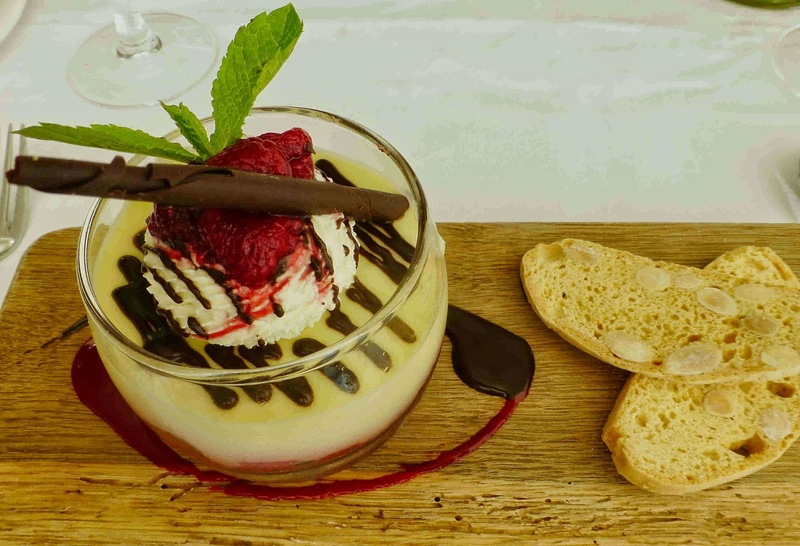 We hadn't been expecting much but this was by far and away the best Panna Cotta I’ve ever had. 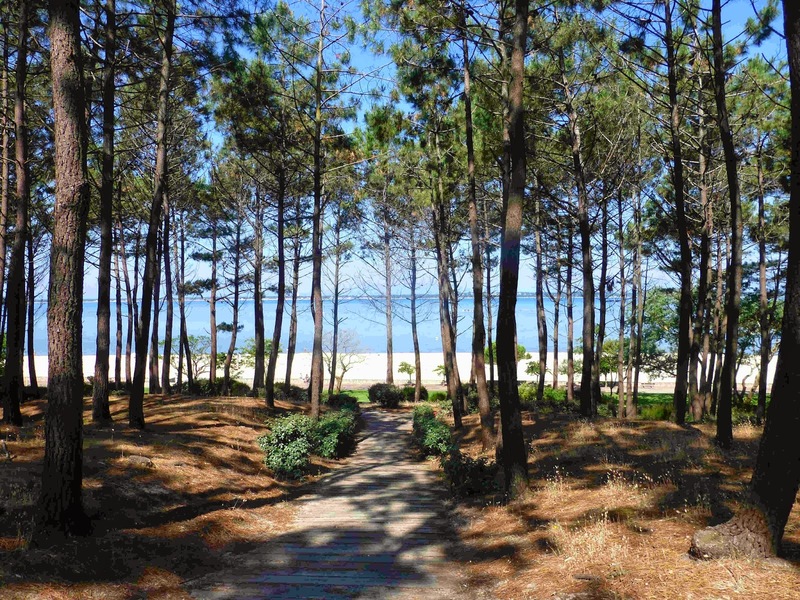 Back in Arcachon, I had a walk along the Boulevard Deganne (we are based just off it). It is a lovely street, trees galore, one of the best small town streets that I’ve come across. I came back along the Boulevard de la Plage, on the lookout for wineshops. I found just one and asked him if he stocked a Listrac-Medoc that I’m looking for, a Saransot-Dupre. He told me instantly that he didn't know the wine. I was amazed at that, considering its produced about an hour away. No point in eating out this evening after our big lunch so, before going back to the house, I picked up a tempting looking Salad Nicoise from the local traiteur. A boiled egg or two is being added and all will be ready soon. No tasting here today. Nor with a while me thinks! at Plage Pereire, west of Arcachon and facing Cap Ferret. Great facilities here, including ample car parking. walkers and some well maintained green areas for picnicers. the short trip to Pyla before heading "home". including a pork curry as main course. Bon Appétit! Hang gliders visible on the magnificent Dune du Pyla. Finally made it to St Emilion and too did tout le monde. The season has started here for sure and the tourists, including this Irish pair, are out in force. And the wine-shops are ready, ready to deal in dollars or yen, en premiere and any wine investment you fancy. Not for me. First priority was to find a parking space and this we did, within yards of the local Maison du Vin. They have a big selection here but no tastings. Not very well up on St Emilion so I stuck to 2009 and 2010. Had some notion that Chateau Haut Rocher was a good one and got some, though the most expensive purchase was the 2010 Chateau Haut La Grace Dieu. Also picked up a few cheaper ones from Lussac. With the tourists in, prices are up. For instance, an espresso here costs €2.50 as against €1.50 in Arcachon. 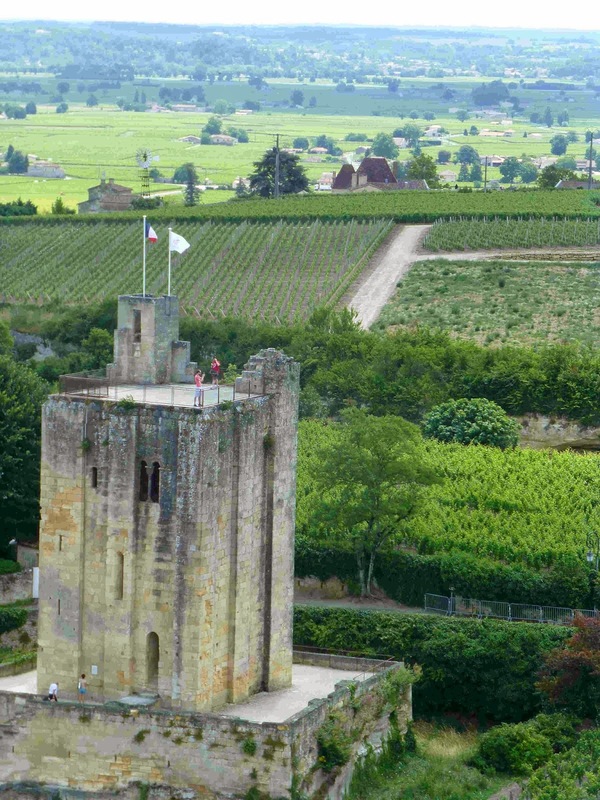 Don't think it cost me that to get to the top of St Emilion. Had a lovely chat with the young man in charge of the entrance to the tower - he is coming to Cork as he loves the Irish women. It was a fantastic climb to the top of the Bell Tower of the Monolithic Church (I kid you not!) 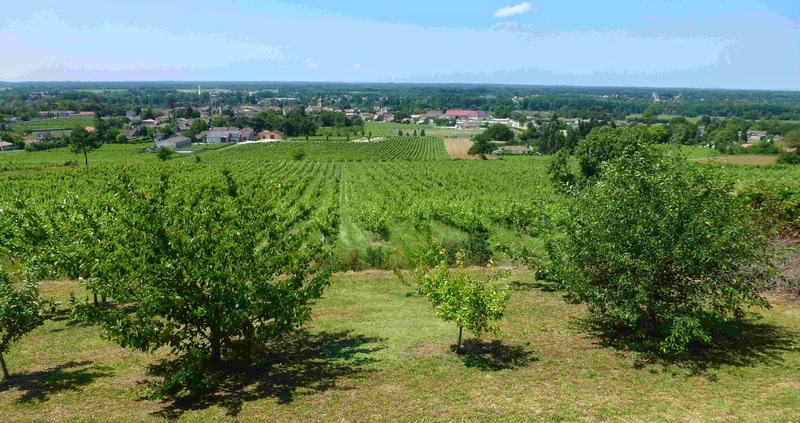 with some great views out over the Cote Pavie slope and more. 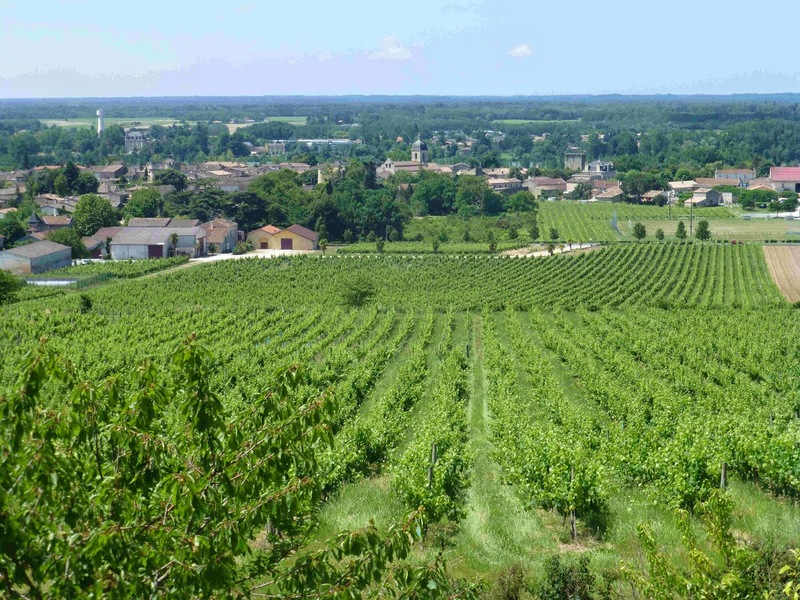 Much of St Emilion is classed as Cultural Landscape by UNESCO since 1999. Has France stolen a march with these UNESCO bods or has Ireland been slow off the mark? Back down then for a visit to the ancient church and its intact cloisters, also a stroll round that part of the town, some slippery shiny paving stones there in the narrow streets (bring decent footwear), and a quick look at an art Expo before heading for “home”. Earlier, in Podensac, we had renewed acquaintance with our friendly server in the Graves Maison du Vin. We loved our initial haul here and that drew us back. One of the stars this time is the Rochemorin blanc 2010. We bought a few bottles for just €11.95, knowing that the same bottle cost us fifty euro in a local Arcachon restaurant (Le Patio). As we left with our haul, our friendly server, another who now wants to come to Cork, gave me a “Daddy Day” pressie, some Graves drop stops. Merci beaucoup! As we approached Arcachon, we were getting a little worried about dinner as many restaurants and shops close on Monday. But our traiteur friend in Chez la mere Catherine came to the rescue with his plat du jour, Axoa de veau (€10.12 for two), a Basque dish that we regularly enjoyed during a stay two years back in Hendaye. He also supplied dessert: Fondant a L’Orange (€5.60 again for two). Sipping a superb refreshing Chateau Bauduc rosé (by Gavin Quinney) as I anticipate dinner and maybe a World Cup match (must check what’s on!). Easy on a Sunday. Man who Walked Above Water. It was an interesting walk in the sun, though this day wouldn't prove quite as warm as the previous few, with exceptions such as our front garden, down in a dip and quite a sun trap. 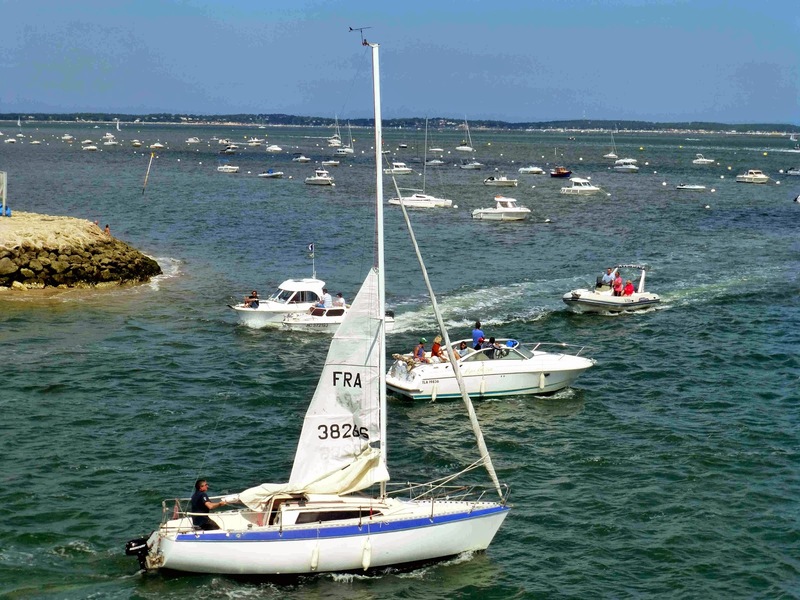 I’ve mentioned the amount of boats in Arcachon quite often since coming here and today I saw something unusual. 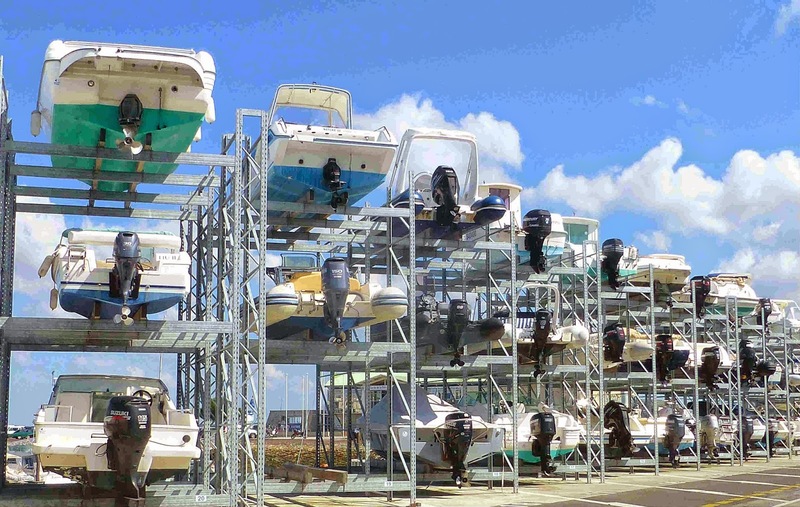 In one big yard in the marina area, there were two huge “shelves”, three boats high, all ready for sale I presume or else a way of docking them as the marina is almost constantly full. Look closely at the photos and you'll see a tube under the man, probably clearest in the bottom shot. This is connected to a boat and provides the propulsion. Continued our walk to the very end where this outer road meets the exit neck of the marina. The traffic there, inwards and outwards, was amazing, all kinds of boats, engine and sail driven, work boats yes but mainly pleasure craft today, some very small, some quite large, all in all quite a spectacle that kept us entertained for a spell. Off the shelf. Boats to go! To our rear, and sharing this slightly elevated viewpoint, stands a large monument, dedicated to those who have perished at sea.. Apparently, the local fishermen say a prayer as they sail out. On this good day and in the sheltered bassin, the pleasure boat people didn't seem to be visibly worried at all and only a few children wore life jackets. All this walking - we would go to the beach in the afternoon - makes one think of food and we called to out traiteur and picked up some Veal in Rice for dinner. By the way, just to return to yesterdays Rabbit with Prunes. We got a good chunk for €12.90 at the market and had enough left over to serve as lunch today and it was just as delicious cold. Lazy Saturday. In Beer, Banish the Bland! When in France, we tend to take it easy at the weekends, avoiding the crowds in the popular areas and the traffic on the major roads. Today followed that pattern. A late rise was followed by a leisurely visit to the local market where Stuffed Tomatoes were bought for lunch and Roast Rabbit for dinner. 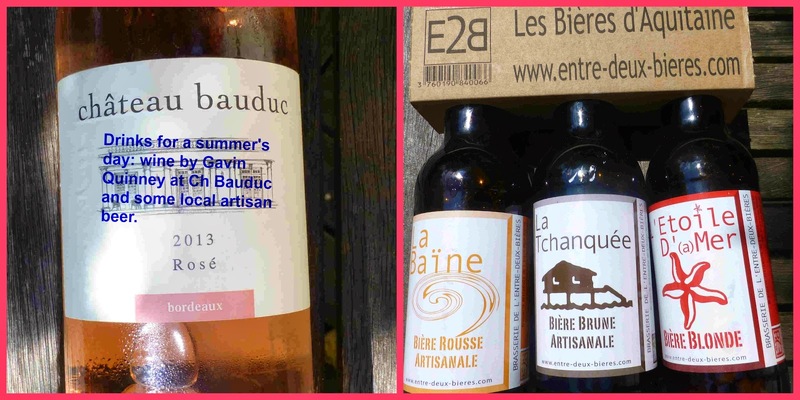 On the way home, we called to a local speciality shop and bought a few presents and also a few bottles of local craft beer by Aquitaine brewery E2B. Enjoying one of those now, the red beer, as I type. The earlier one was compared to a Pale Ale. Both so far are excellent but different. The Red Beer, for instance, contains black grape juice and cane sugar, so you get different flavours. But that is par for the course and one of the attractions of craft beer. In English or in French, the message is the same. Banish the big and the bland! With the aromas of the Roast Rabbit rising from the kitchen below, I don't want to go on too long with this post. Just a line or two to say we spent the afternoon on the beach and in the waters of the Bassin. 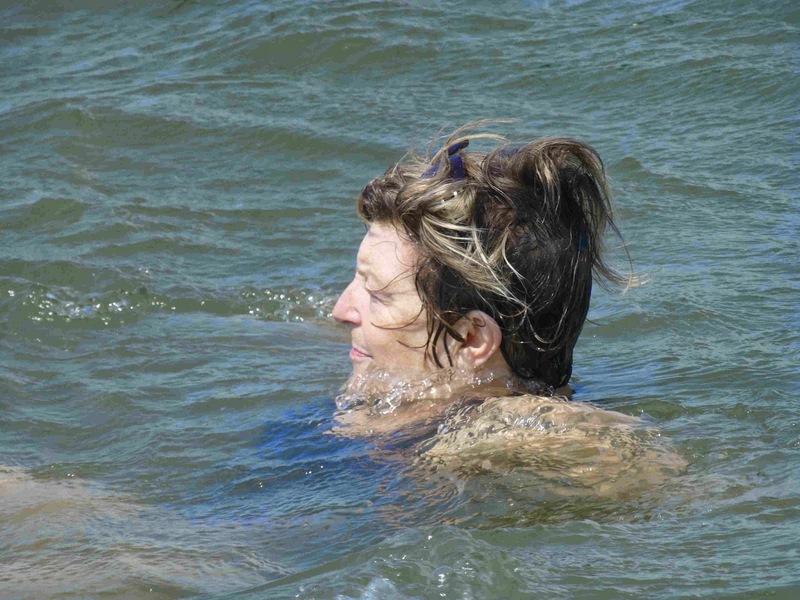 Surprisingly windy but that gave a welcome cooling and the waters are warm. The amount of boats in the marina here is staggering and even more staggering is the traffic on the Bassin. 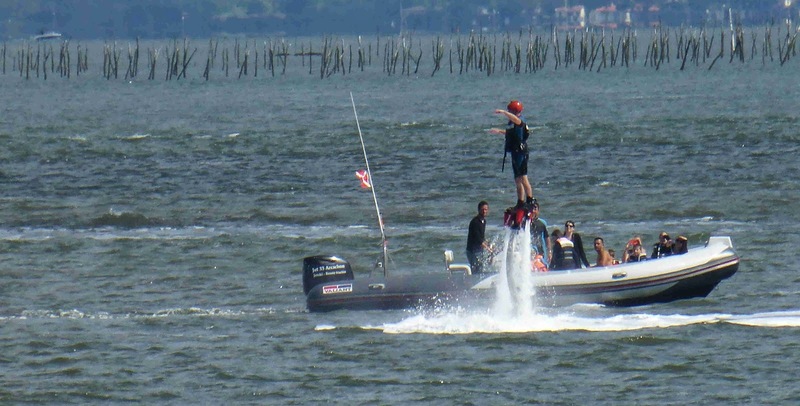 In daylight hours, between fishermen’s boats, excursion boats, ferries, yachts, even jet-skis, there is never a dull moment on the water. Bye for now. That rabbit is proving irresistible! 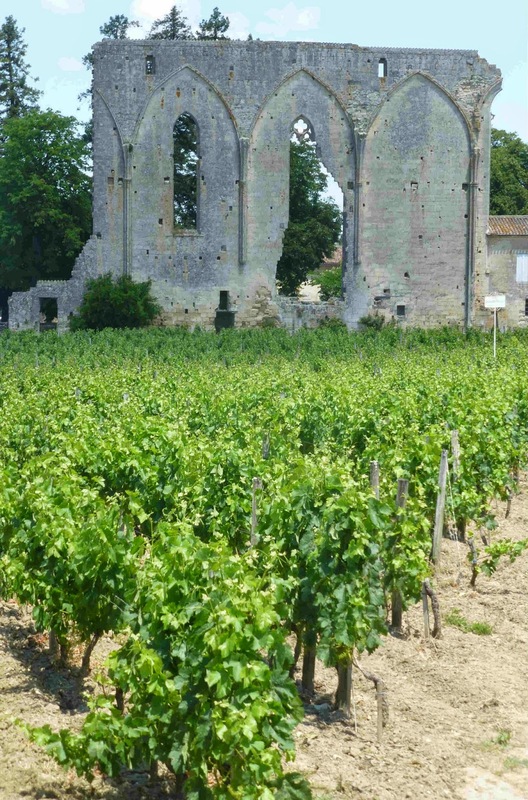 In the Medoc today. €1439.80 wine. €14.00 lunch. 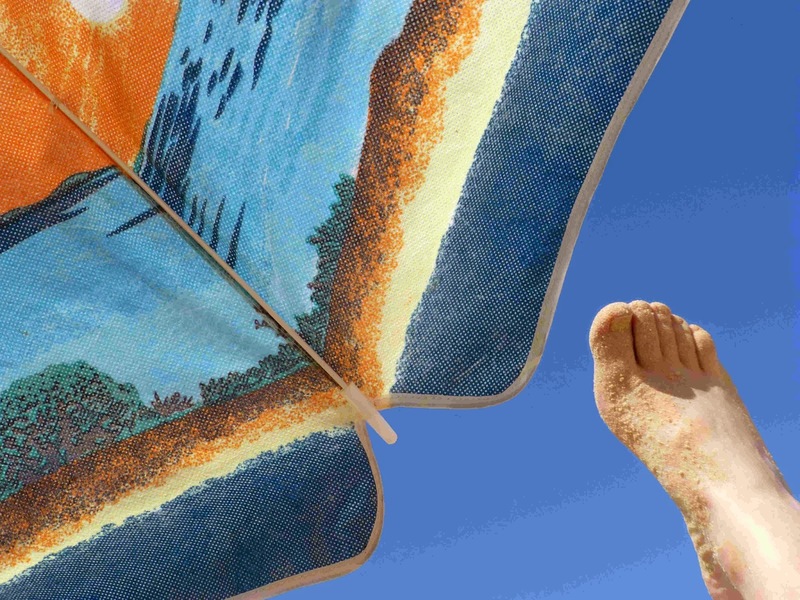 Day of Rest in Arcachon. Hot on the Beach. In the Heart of Graves. A Sweet Surprise.